A luxurious spin on the traditional Hot Cross Bun recipe, I’ve added dark chocolate chunks along with stem ginger and orange to the spiced dough. Have a go at making these aromatic buns for Easter – they take a bit of time, but are totally worth the effort as you split them open and slather them with butter. Waitrose have asked me to come up with a new flavour suggestion for a hot cross bun to help kick off their #WaitroseHotCrossBun competition which runs 14th – 20th March. The best one will be turned into a product that will hit the shelves next year! Waitrose judges will narrow down the entries to a final three and then there’ll be a vote on social media to determine the winner. The top flavour will be announced by the end of May 2016 – first prize bags £500 Waitrose vouchers with the two runners up getting £100 Waitrose vouchers each. Fingers crossed! 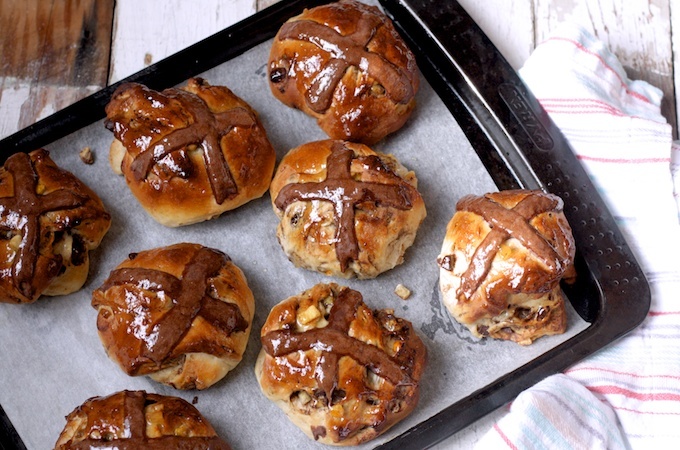 As well as loading my dough with mixed spice, orange, ginger and dark chocolate, I topped the buns off with chocolate crosses and a zesty seville orange marmalade glaze. A bit of sweet, a dash of spice and a touch of tang – I think i’ve got all my favourite flavours covered here. I’m quite a lazy baker, so instead of kneading these by hand I took full advantage of the dough hook attachment on my KMix. I don’t make bread that often as i’m nervous it won’t turn out well. I’ve had a few disasters where the texture is just too dense and hits your stomach like a brick. However these turned out an absolute treat. A lovely crisp crust with the tangy marmalade glaze giving way to a soft and doughy interior that demands an indecent amount of butter. The thing that takes the longest with hot cross buns is the rising and proving time, so you’ll need to set aside a morning or afternoon. It’s a good excuse to hang out in the kitchen though and you can get other stuff done while you wait for the dough to work its magic. Heat the milk in a pan until it starts to bubble at the edges. Remove from the heat and add the butter and stir until it melts. Leave to cool until it’s body temperature. Sift the flour into a bowl with the salt, sugar and yeast and make a well in the centre. Pour in the milk mixture along with the beaten egg and mix together until a sticky dough forms. Tip onto a lightly floured surface and knead for 5-10 minutes until smooth and elastic. Or use a dough hook in a mixer and knead for 5 minutes. Put the dough in a lightly oiled bowl, cover with oiled cling film and leave in a warm place to rise for 1 hour until doubled in size. Add the chocolate chips, mixed peel, ginger, orange zest and mixed spice to the dough in the bowl and knead until it’s all well distributed. Cover again with oiled cling film and leave to rise again in a warm place for 1 hour. Line two baking sheets with baking parchment. Divide the dough into 15 pieces – weigh them out at about 75g each to make sure they’re equal and therefore cook evenly. Shape them into balls and place onto the prepared baking sheets. Cover with oiled cling film and leave them in a warm place for the final time for 1 hour until they’ve doubled in size. Pre-heat the oven to 220C/200C fan/gas 7. To make the crosses mix up a thick paste with the flour, cocoa, icing sugar and about 5 tbsp of water. Spoon into a disposable piping bag, snip off the end and pipe crosses on top of the buns. Bake in the oven for 20 minutes until golden. Tap the bottoms – if they make a hollow sound they’re done. Gently heat the marmalade, push it through a sieve to get rid of any rind and then brush each bun to glaze. Allow to cool a little and then serve warm with plenty of butter. Absolutely gorgeous – I love the flavour combinations in there and I haven’t ever seen a chocolate cross before so that’s novel and I’d definitely buy these – I hope you win! 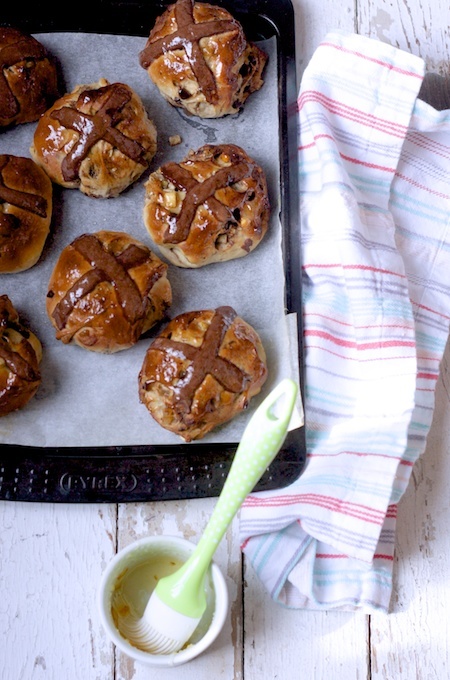 How to make hot cross buns even more delicious – add chocolate 😀 They look yummy! Oh we had our first hot crossed buns of the year yesterday – I don’t think they were nearly as good as your chocolate, orange and ginger version though! 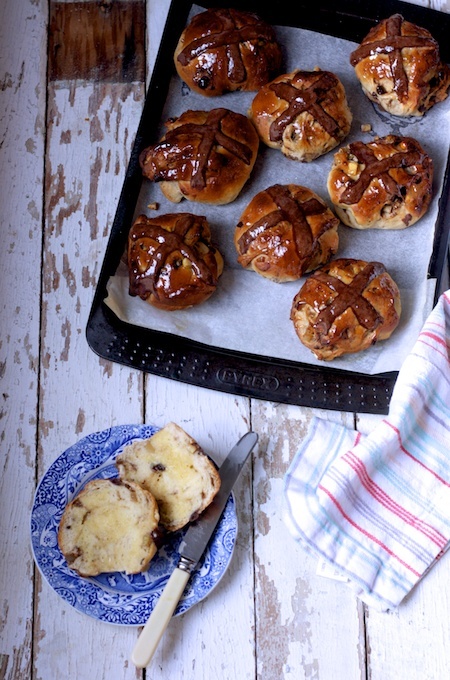 Bring on the season of the Hot Cross Bun! Fantastic flavour combinations and love the chocolate crosses. Every Easter I say I’m going to attempt to make Hot Cross Buns. Perhaps this year I’ll actually do it?! Go on… have a go! Honestly if I can do it, you certainly can! these look amazing! I made banana and cinnamon HCB’s but my second choice was going to be chocolate orange… although I think yours look better than mine would have been! Loving the sound of banana and cinnamon Dom! fabulous twist on the traditional buns Katie. I am not sure if I will get any this year as will be skiing, and I don’t think they are a thing out of the UK. Those sound and look wonderful Katie. You got the right flavours for me. Gorgeous! Stumbled, tweeted and yummed!